Hey gull fans here’s a few pictures for you to puzzle over. 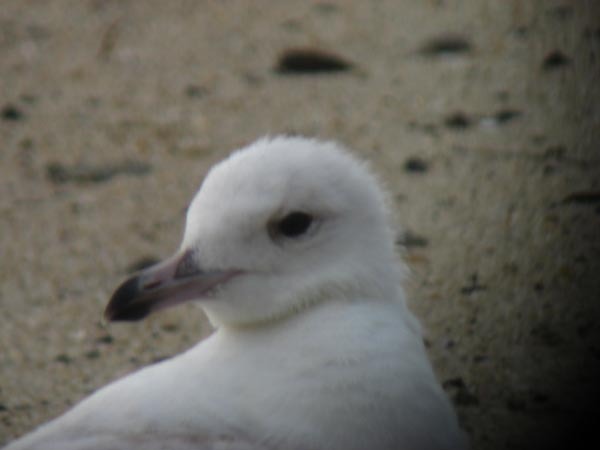 These digiscoped pictures were taken in Provincetown MA today of a gull found by Tina Green recently. This is one well and truly worn and beaten up gull (note lack of feathers on the nape and back of head.) 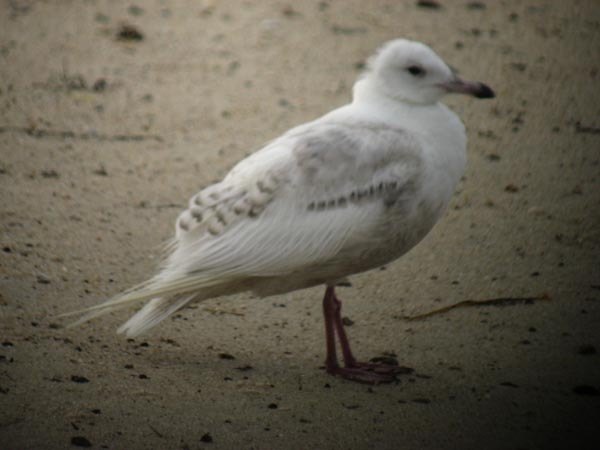 So the bird itself seems a little less bulky in the field than a Herring gull, the deep pinkish legs, dark eye and head shape (what you can make of it) seem to point towards a possible first summer Kumlien’s Gull to my eye. Anyone else got any thoughts? EDIT: The voting thus far seems to be two and two halves for leucistic Herring (a couple of people hedging bets?) and one and a half votes for Kumlien’s Gull. My vote for what it’s worth was that initially the previous pictures I was sent had me leaning towards a Herring (as others pointed out the heavy feather wear is in line with leucistic feathers) but did wonder about the leg coloration and a bill and bird overall that apparently seemed smaller in the field to nearby Herrings. Perhaps noteworthy that no-one is being drawn into an online ID so I’m not naming names on how the voting went 😉 Any more thoughts appreciated. Man I hate gulls – especially ones that look like this one!!!! 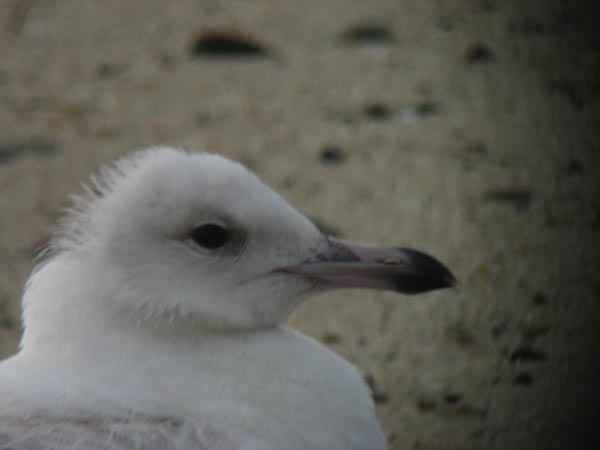 EDIT 2: Nick of Shorebirder blog fame and king of rare gull finds in CT dug up some pictures from Rick Heil’s photstream from earlier in the month that has the bird tentatively ID’d as a Kumlien’s Gull (see more pics here). ..we are in Cape cod now.. has the gull been seen lately? Still there as far as I know! I’ll be checking again tomorrow as we did’nt see it this AM. I located the possible Kumlien’s gull on the bit of sand next to the Provincetown Inn on the dike side early this AM.This is where I have normally seen it and there were no other gulls or shorebirds there.